One of the main facts that flipped steady Asian markets into a state of turmoil from 2Q18, was that the dollar finally succumbed to Fed tightening, and started to rise. Up until then, and coupled with notions of "synchronised global growth", Asia's currencies had remained relatively strong. Inflation remained subdued, and central banks were able to sit on their hands, allowing domestic demand to thrive. That story changes abruptly when the dollar began to rise, as it is now doing again. For the externally challenged. IDR in particular, but also INR and PHP, external debts become less manageable. If inflation is also on the high side, then that becomes worse. For the three above, inflation is also of some concern. Throw in high oil prices, and the energy-dependent economies (all of the above) see a further worsening of their external positions and the inflation backdrop deteriorates further, throwing more doubt onto growth prospects as the central banks try to stop imported price rises from becoming embedded. There is some comfort to be had in the notion that this USD strength is, at least partly, seasonal. End of year demand for dollars to make balance sheets seem better is likely a part of this story. But if so, could linger for months. But the EUR is also likely being weighed down by what is happening in Italy and its fiscal stance in defiance of EU rules. That also does not look like going away soon, nor does the Brexit story - negative for both the EUR and the GBP, and by definition, helping the USD and JPY. For now, all this is manageable, and currencies like the CNY remain fairly steady. But the resolve of the Chinese Authorities in the face of a stronger USD could be tested if this pushes much further, and then, all our regional FX forecasts will need a re-think, as the gravitational force of the CNY drags them all into whatever new orbit it moves to. The September PMI for Singapore out late yesterday evening local time, dipped to 52.4 from 52.6. The index peaked in January this year, and has been on the slide since. Although this is not a well-followed index, and there are some doubts as to its usefulness, it does appear to have broadly tracked the economy's rises and falls over recent years. So as a rough directional indicator, its message, while not overly troubling, does suggest some slackening of momentum, and another reason for the MAS to do nothing further to its modestly appreciating nominal effective exchange rate stance at the October meeting. We have also been looking at the electronics component of this PMI, which also ticked down this month to 51.4 from 52.0. 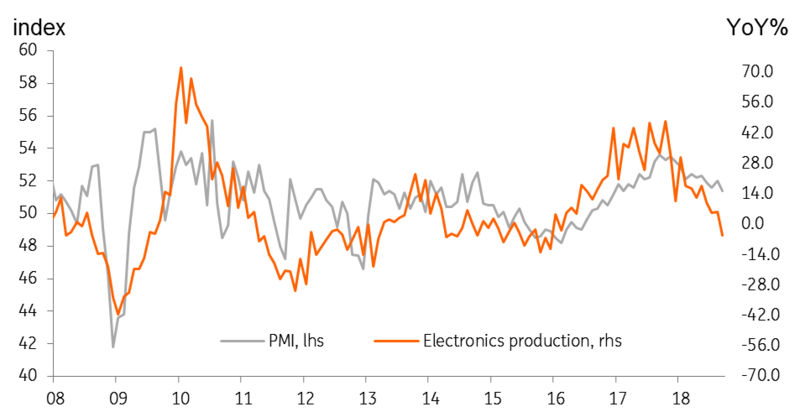 The broad correlation with electronics production is also striking, although the index is not as weak as recent annual electronics production growth would imply, begging the question, "Is electronics production about to pick up, or is the electronics PMI about to drop sharply?" or some combination of both? Electronics was the driver of production in 2017. In 2018, it seems to have stalled, and the pharmaceutical industry, that temporarily took up the slack, seems to have done likewise. We're not 100% sure what's going on. This needs further investigation. Employees in either industry with some insight, please reach out! It's quiet in Asia other than what was mentioned above. Korea and China are both out for vacation. in the G-7, Theresa May's speech at the Conservative Party Conference could be market moving if it suggests any shift on the Brexit strategy. ADP and non-manufacturing ISM indices in the US today could provide pointers about Friday's labour report, and any further comments from Italian politicians will be scoured for hints of Euro break up. In short, politics to dominate markets today.